With Mother’s day only a few weeks away I’ve been playing around with a few ideas that would make great gifts. I think these Plant Pots with Vinyl Decals are the winner! I really enjoy playing and creating cut files, and love to share them with you…for FREE! I hope you like them as much as I do, I know Mom will! Today I’ve teamed up with an amazing group of ladies whom I got to hang with at SNAP this past weekend to bring you a week full of ideas how you can put vinyl to use with Vinyl Palooza! Each day 4 bloggers will bring you some amazing ideas how you can use your Expressions Vinyl to create some really wonderful projects. You can get links to the participating bloggers each day starting at A Girl and A Glue Gun. And at the end of the week, one lucky winner will walk away with a $100 gift card to expressions and the Silhouette Guide Book from Silhouette School. Let the fun begin! 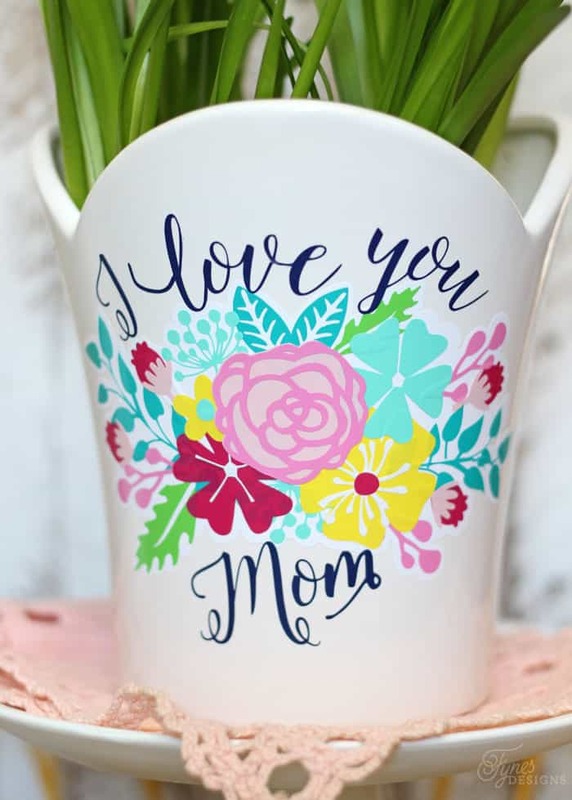 I love working with Expressions Vinyl, and wanted to come up with a unique idea for Mother’s Day. I started with plant pots, but when my sizing eyes got a little skewed and ended up with a tiny vinyl decal I decided to spray paint a mason jar and I think I created my favourite little plant pot! I can’t think of a friend who wouldn’t love this little gift! These Silhoutte flower cut files look complicated, but since they are small they are really manageable. Since the pieces are small its a really great way to use up those little scrap pieces you can’t bare to part with. In the first photo you can see all the individual vinyl cuts. The cut files are grouped just as seen so you can easily move one color on and off the mat in Silhouette Studio. Next layer the flower pieces, putting the centres on. These pieces are small enough I didn’t even use transfer tape, just lift and stick. Then begin to layer the outside elements referencing the coloured cut file image. Add on larger flowers to complete. 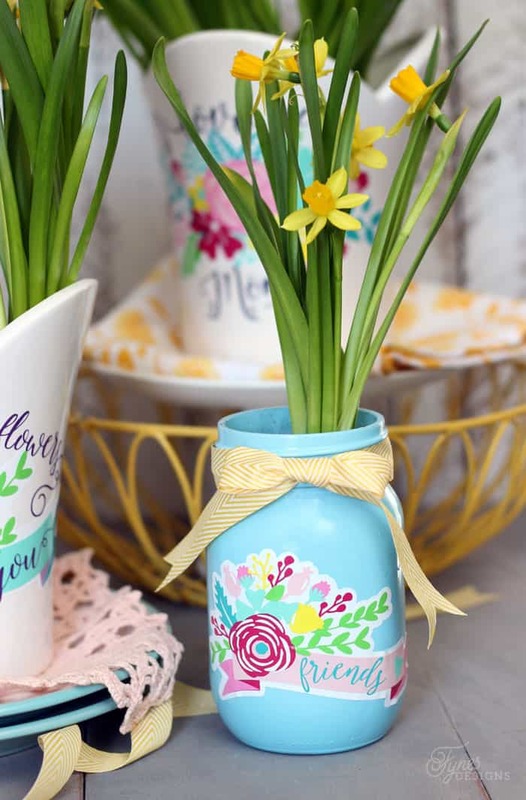 Use transfer tape to apply the floral decals and text to a clean plan pot or mason jar. Isn’t it cute?! Really adds a sweet touch to an otherwise plain plant pot. 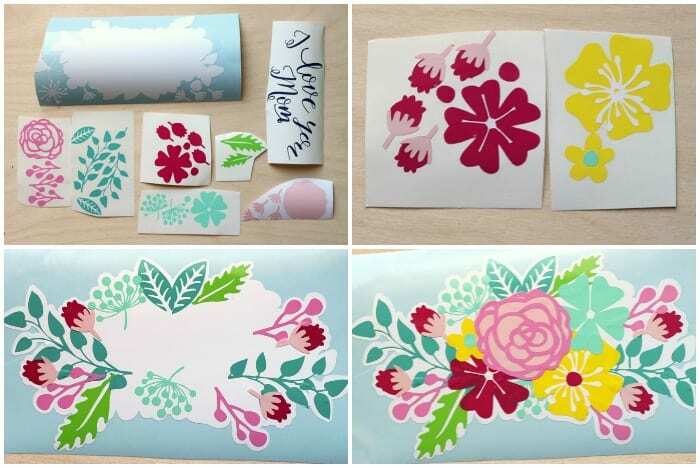 Expressions Vinyl has loads of great color options so you can really customize the design to suit any mom or friend. I also wanted to make a more generic sentiment to go with these floral cut files. 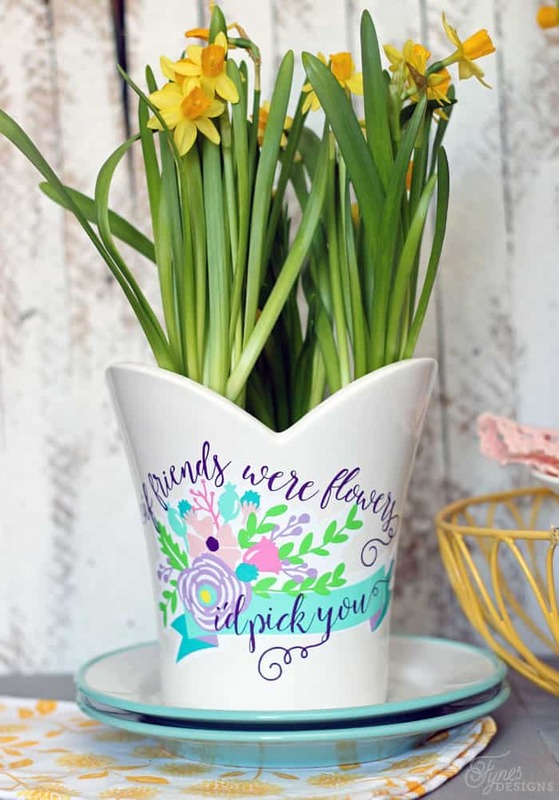 “If friends were flowers, I’d pick you!”, is the best sentiment to go along with a cute plant pot! 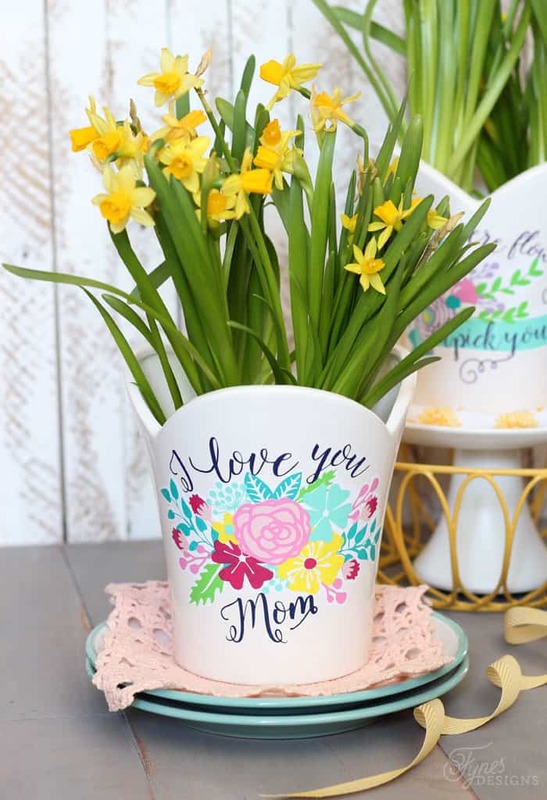 Not everyone has a Mom to show love to on Mother’s Day, we have a step-mom that is just as important but often hard to find specific Mother’s Day gifts for. I’ve also included the words moms, grandmas, sisters, aunts, and daughters with this file. You can easily switch out ‘friends’ for any one of those words to make a great gift for any lady in your life. 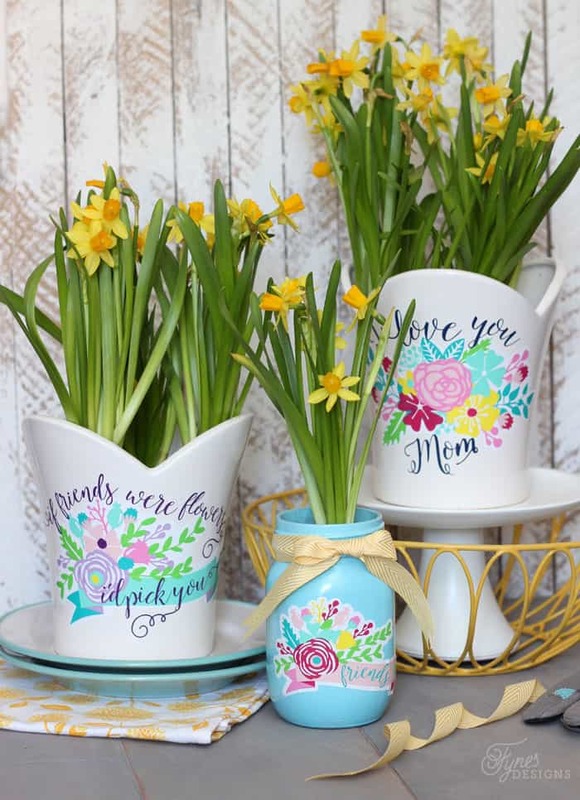 This Mother’s Day gift idea is so fun, and make it for only a few dollars! 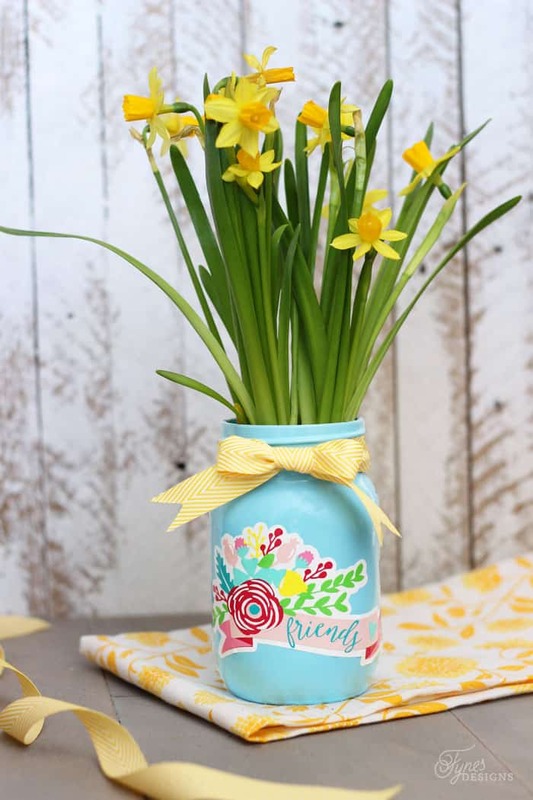 A mason jar or plant pot, a handful of vinyl scraps, and a tulip bulb made this little gift come in at under $5!! 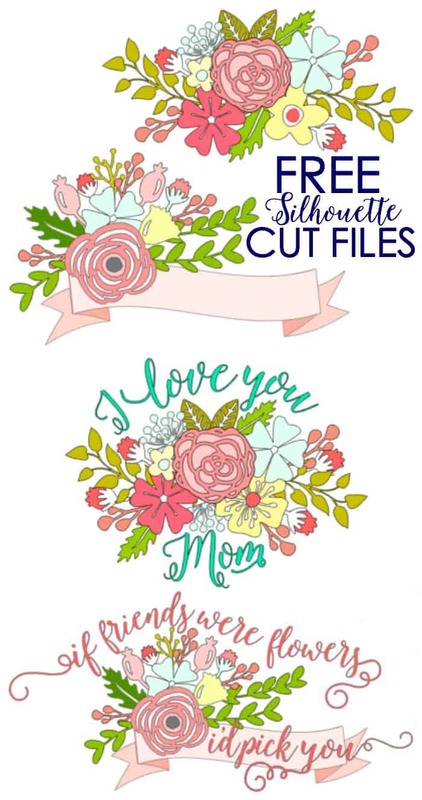 I hope you enjoy these Free Silhouette Cut files, please subscribe to Fynes Designs so you don’t miss out on other freebies! Be sure to enter below to WIN a $100 gift card from Expressions Vinyl AND The Silhouette Guide Book from Silhouette School. I’m just seeing this picture but where do I go to download the file? Beautiful. Thank you for the cut files. Th is a beautiful cut file. Thanks for sharing. how lovely! these vases are so beautiful and would be a perfect gift for yourself or anyone 🙂 yeah, I want a few lol! I don’t have a silhouette yet but man, the more I see the more I want! This is idea is SEW special. I wish I would have found it before Mother’s Day. It would have been the perfect idea for the Memory Care unit activity group to do for the many Moms in the center. I love all the projects you made with the silhouette. I don’t have one. But, if I did I’d love to try this. Thanks for sharing your recipe at the Inspiration Spotlight party. Shared & Pinned. Hope to see you again soon. Wow..these are so beautiful. They would make an awesome present! Thanks for sharing with us at the Home Matters Linky Party! Hope you join us again! Thank you so much for the design and the instructions on layering. I haven’t tried to layer yet. May I ask, are your free files for personal use only? Like the flower cluster one. I love this idea, do you know where you got the plant pot from? I absolutely love this cut file however I can’t seem to download it. Any suggestions?